I noticed there was a Zappos sale going on last week (it ends Aug. 5th I believe), but MAN do they have a lot of great classic pumps on sale. Wide selection of sizes and styles from brands like Cole Haan, Salvatore Ferragamo, L.K. Bennett, Stuart Weitzman, Aquatalia, Clarks, Rockport and more. Someone talk me out of these, please. Pictured at top: these classic pumps are down to $415 from $595. Lots of colors and sizes on sale! Has anyone tried Smile Direct Club? It appears to be the same as Invisalign but through the mail. It also looks less expensive than Invisalign. I had braces as a kid but could use a little straightening up, nothing major, and this seems like an easier way than having to go to the orthodontist monthly (and did I mention cheaper). But does it actually work? Anyone used this before? Yes! I had very crowded teeth, and my treatment plan was about 9 months with trays switched out every 3 weeks. Then you need to wear the last tray around the clock for 6 more months, which I’m in the middle of. Then every night for the rest of your life. The process is way more annoying than I expected it to be, because I have a job where I need to be speaking a lot, including over the phone, and it did give me a little bit of a lisp. I also like to have leisurely meals and sip glasses of wine over an evening, so I know I wasn’t wearing the trays optimally (you’re supposed to wear them 22 hours a day). However, it still worked, and I’m overall happy with the results. I maxed out my flex account so it was taken out pre-tax. 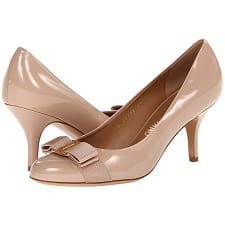 Anyone have any strong feelings about Nine West flats? They have some on sale. I haven’t tried Nine West in many years because I found their heels ran too narrow for me, and am wondering if their flats 1) have that problem or 2) hold up reasonably well to wear and tear. Torin, I personally Love 9 West, but agree with you. But I am not sure about flats, but you should know that I also have heels that could be a little trimmer, so Dad says that I get that from Grandma Trudy, who has piano legs. Mom thinks that Grandma Leyeh also has fat calves (and ankles), so the heels would necesarily follow suit. 9 West shoes are very styleish, so if you buy them, you can be pretty much assured that men will look at your leg’s. And that is the name of the game–finding guys who want to marry me. That is why I wear 9 west, among many others. YAY!!! My Nine West flats have held up well to wear and tear. I have a narrow heel, so I can’t really comment on that, but I got my flats in Wide and they accommodate my awful bunion.